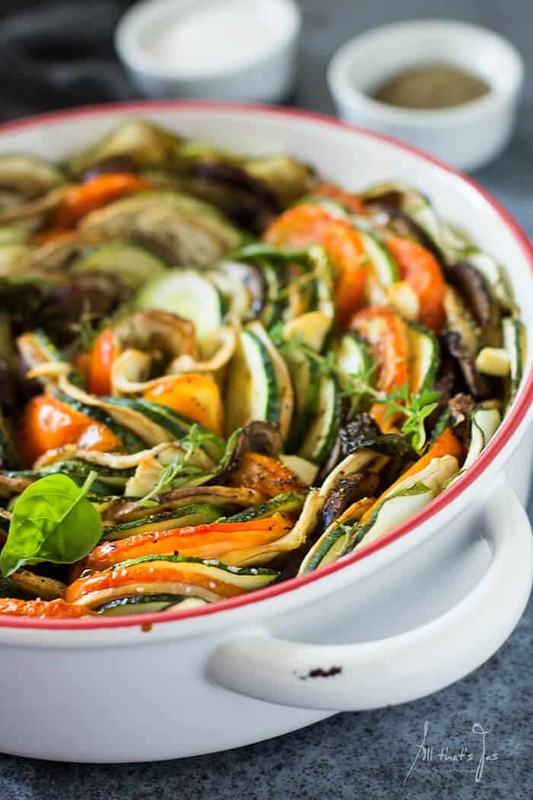 Tian Provençal is a French vegetable bake named after the ceramic dish from Provence used for baking and serving. Looking for new ways to use up my garden produce, I found this dish and first fell in love with its design. 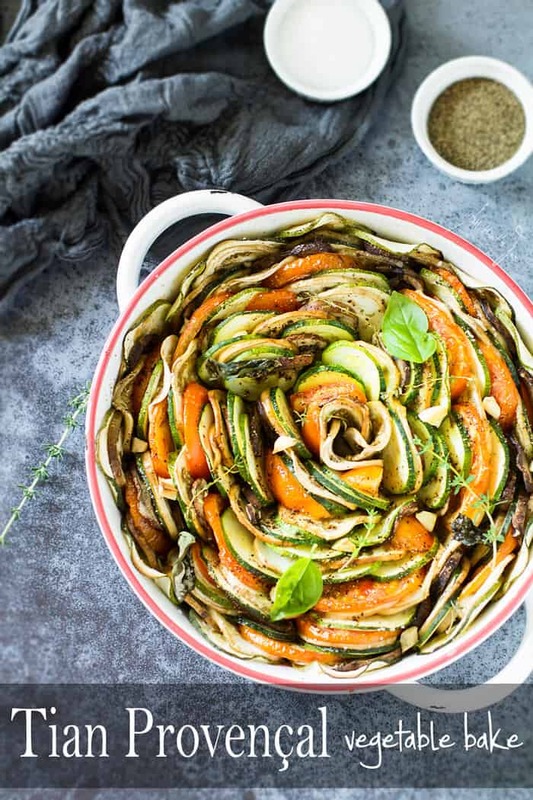 If you search images for tian Provençal you will find some cool, artistic ways for layering. I was in awe. Creating a dish that is pleasing to the eye as it is to the palate is a win-win. I love the simplicity of the dish, no bells and whistles. But the flavor is so satisfying you will be kicking yourself in the rear for not making it sooner. At least that’s what I did. The texture of tender vegetables is perfect. A little bit of thyme, basil, and garlic goes a long way. Serve it with baguette and a glass of wine, close your eyes and you’ll feel like you’re in Provence on vacation. Try it. Note: you can also use yellow squash and sautéed onions if you like. I added sliced mushrooms into the empty spaces between the vegetables. Finely slice the clean vegetables cross or lengthwise, using a mandoline slicer. Lightly oil a round oven-proof dish. 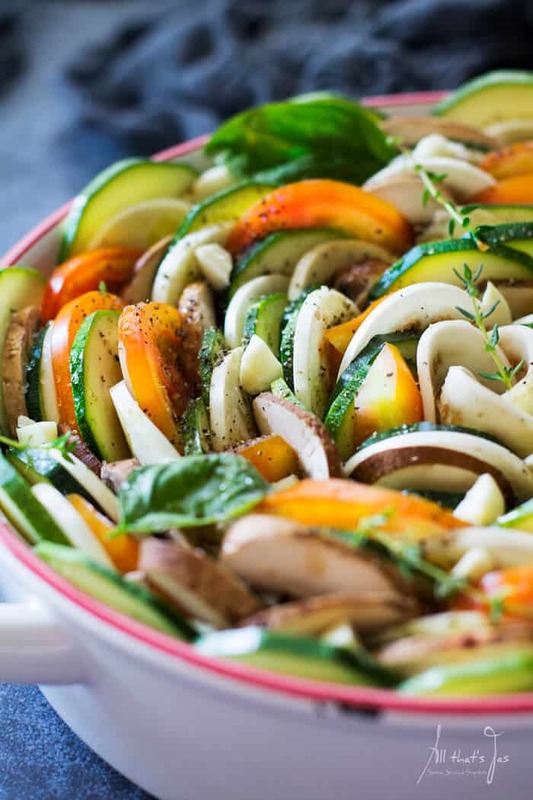 Starting from the outside, arrange the vegetables in a dish in an upright position alternating colors. Press them in tightly. This task may need extra patience or a third hand to help. Alternatively, use a square dish or arrange vegetables in rows, or layers like lasagna. There’s no wrong way of layering. Tuck garlic pieces between the vegetable rows. Drizzle with oil, season with salt and pepper, and top with thyme. Bake uncovered until vegetables are tender, about 50-60 minutes. Serve warm or at room temperature garnished with torn basil leaves. 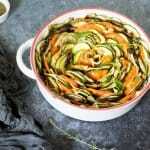 What is your favorite vegetable recipe? Do you like eggplants? You might like these recipes: eggplant caponata, bouranee baunjan, roasted eggplant fan or a classic eggplant parmesan. Btw, I have no idea how my oil made those curly patterns. Neat! 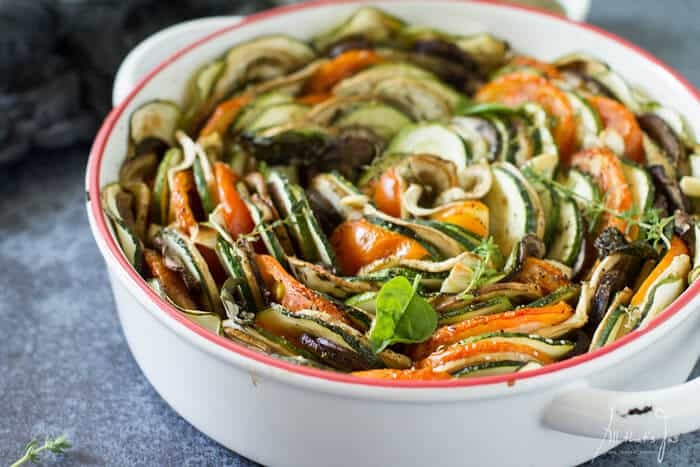 This tasty French dish with baked fresh summer vegetable tastes even better made a day in advance. Finely slice the clean vegetables using a mandolin cross or lengthwise. Lightly oil a round oven-proof dish. 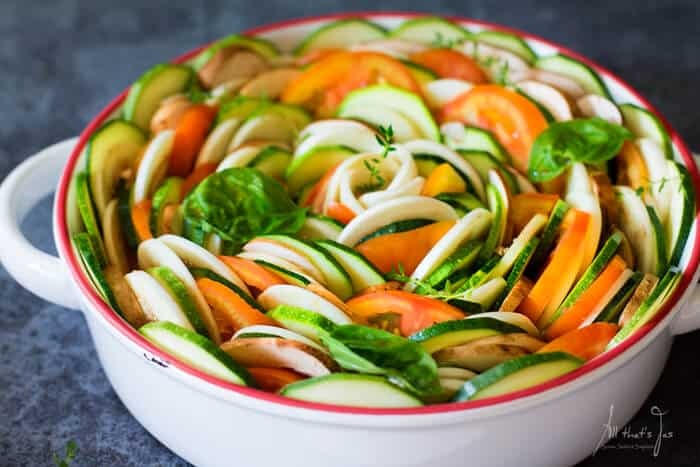 Starting from the outside, arrange the vegetables around the dish in an upright position, alternating colors and pressing them in tightly. This task may require extra patience or a third hand to help. Alternatively, use a square dish or arrange vegetables in rows, or layers like lasagna. There’s no wrong way of layering. You can also use yellow squash and sautéed onions if you like. I added sliced mushrooms into the empty spaces between the vegetables. What perfect timing for this recipe: my vegan daughter and vegetarian grandchild are coming for a visit. I can set out a gorgeous meal for them–if I can make it as carefully as you did. I’m so glad for the timing! 🙂 I’m sure you’ll make it even better. Thanks for stopping in and have a grand day! This looks beautiful. I am going to have to make one. Aw, thank you Jae, you made my day 😀 Wishing you a wonderful weekend!!! I love this – great way to serve veggies! Jas, Oh my Goodness, first off, your photography is just amazing and this just looks so pretty and delicious at the same time! What a great recipe, eggplant is one of my favourite veggies! 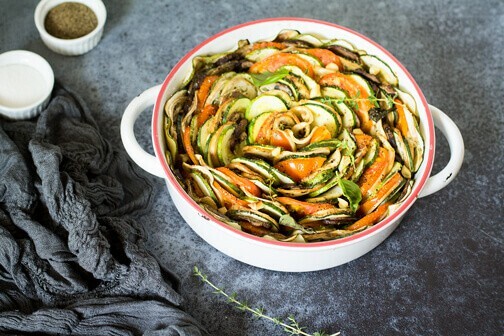 What a beautiful way to cook vegetables! Thanks for the idea! The visual effect definitely plays a big role in this dish. Thank you, Heidi! Thanks and thank you for stopping in, Helen! Hope your week is going great. Thank you, Nicole. I want to make it every week, just to try different designs, lol. Hope your day is amazing! What a great combo of veggies, I love then all. Thanks for sharing at Inspiration Galore Projects!! Thank you so much, Fabiloa! Wishing you a wonderful day! This recipe hits all three, healthy, pretty and looks delish. I am always looking for new ways to eat veggies. This sounds so good– and it looks absolutely beautiful! Thank you, Courtney! When it looks so pretty, you forget you’re eating vegetables, lol. That not only looks beautiful – it looks delicious! !